Find out about Holland in the very best way by cruising along one of the special, extensive waterways that form an elaborate network stretching throughout the country. You will glide past almost endless tulip fields and see many small picturesque places in the course of quite a number of memorable excursions. In addition to visiting Amsterdam other highlights of this cruise include the cities of Ghent, Antwerp and Brussels. *Excursions operate at the same time; only one may be booked. We reserve the right to make amendments to the timetable and program. After a restful night onboard, set off to see the sights of one of the most unique cities in Europe. Beautiful bridges connect the numerous parts of the city divided by hundreds of canals and waterways, overlooked by 17th century architecture. Be sure to stop by the Oude Kerk (Old Church), the oldest building in the city. In a nearby village, visit a cheese farm to learn about Dutch cheese production. This evening, enjoy a delicious dinner as we continue to explore the Netherlands. Experience the wonderful landscape along the river before arriving in Arnhem for lunch. This afternoon, explore the city of Arnhem, a small metropolis that was greatly affected by WWII. The Open-Air museum recounts daily life in Arnhem or visit the former Second World War battlefield and the Airborne Museum “Hartenstein”. You can also visit the Burgers’ Zoo, the most-visited zoo in the Netherlands. Back on board, enjoy dinner as we cruise to the Capital of Zeeland. After a morning spent cruising the waterways, we arrive in the picturesque town of Middelburg. In the Golden Age (17th c), the Dutch East Indies Company flourished, evidenced by the merchant houses and storefronts that line the canals. Overnight, cross the border into Belgium and reach the city of Ghent where your vessel will remain anchored for the day. The city of Ghent is the country’s third largest city and one of Belgium’s best kept secrets. Home to the beautiful St. Bavo Cathedral and the famous Ghent Altarpiece. Ghent also is home to numerous other museums - something for everyone. Another beautiful city worth visiting is nearby Bruges, a UNESCO World Heritage Site. Visit the Basilica of the Holy Blood which houses a relic, a vial of blood, that is said to be that of Jesus. Another worthwhile stop is the Groeninge Museum, with its collection of artwork that spans several centuries. This evening, join your fellow travelers for dinner. Wake up in this beautiful Belgian City where there is plenty to discover. Although famous for its diamond trade, Antwerp is also home to numerous cultural jewels. Among them, the Cathedral of Our Lady with paintings by the famous Baroque artist Peter Paul Rubens, including the Raising of the Cross and the Assumption of the Virgin Mary, is not to be missed. Spend the afternoon in Antwerp following individual pursuits or venture to the nearby capital city of Brussels, a major center for international politics. In the evening, enjoy the Captain’s Gala Dinner. On today’s return to the Netherlands, the ship stays in port until late evening. Morning excurszion chocies are tour of Rotterdam icluding a tour of the famous Food Hall or a visit to the historic windmills of Kinderdijk - a good example of the rich history of the Netherlands. After lunch, a chnace to visit the famous Keukenhof Flower Gardens. This beautiful park features more tulips in flower than anywhere else in the world. Over 7 million bulbs are planted here annually, with visitors from around the world coming to explore the 9-and-a-half-mile network of footpaths, including the largest sculpture park in the Netherlands. An evening cruise of the Rotterdam Harbor while onboard offers a great view of the city lights. City tour Amsterdam with canal cruise 61 US$ p.P. 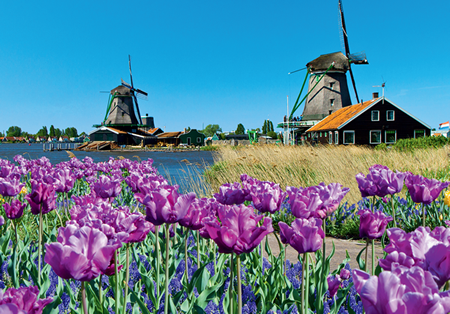 North Holland Excursion 51 US$ p.P. Excursion Arnhem & Open Air Museum or Excursion Arnhem & World War II History 68 US$ p.P. Deltaworks & City tour Veere 101 US$ p.P. City walk Middelburg 21 US$ p.P. City tour Ghent 46 US$ p.P. City tour Bruges 46 US$ p.P. City tour Antwerp 46 US$ p.P. City tour Brussels 46 US$ p.P. Excursion Kinderdijk 80 US$ p.P. Excursion Flower Park Keukenhof 85 US$ p.P.